Posted on September 28, 2015 at 5:42 pm. This is a photo of Pearl, the newest member of the GeriActors and Friends. She is sharing a book that she had bought from Value Village. Someone whom she had never met before had left it for her in the store, and when she opened it, the first page read, “To my black Pearl”. 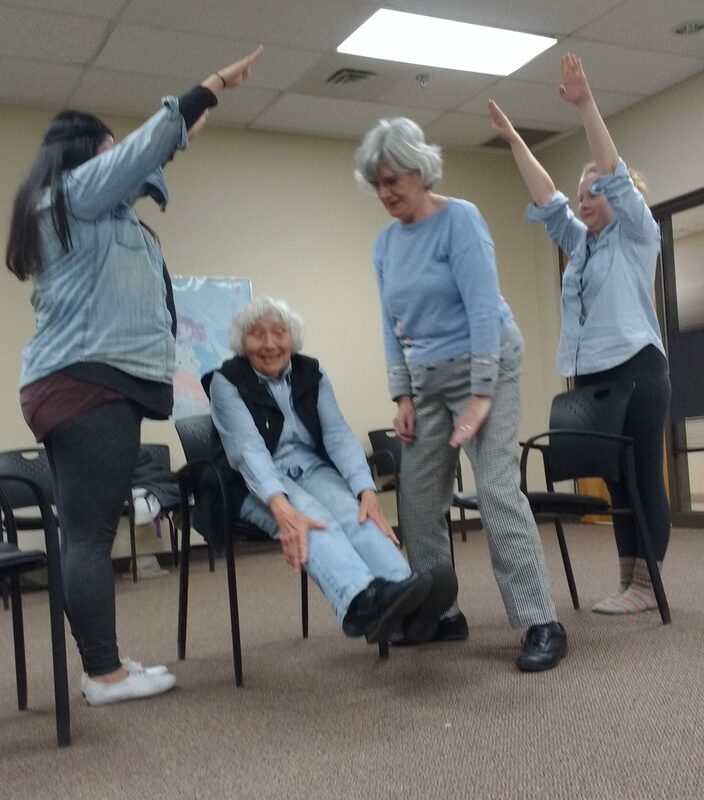 This was one of the many stories shared last week at a storytelling workshop led in conjunction with the students of David Barnet’s Drama 427/507 Intergenerational Theatre class. Our newest Friends. The workshop began with an exercise which required everyone to explain something completely outrageous to a partner. How to fly a magic carpet without upsetting it, how to trick a cat to juggle or how to delicately ride a giraffe. At this point, our minds were ready and our bodies active for creation. We were then given a prompt, “A moment that surprised you”. It took about forty minutes for the group to create four scenes based on these stories. Among these stories was Pearl’s, a story about a little white lie involving growing tomatoes in the garden, a daughter helping her mother move furniture into her apartment and two birds managing to fly into a house through the chimney. What we’ll do with these stories now is a mystery, the possibilities are endless. Do we string them all together? What do these stories have in common? What tools can we use to draw richer details from each story? What types of conversations do these stories bring up? It will be interesting to see what the students come up with. Stay tuned for our Holiday performance in December to see what happens. GeriActors & Friends are at it again! Posted on September 11, 2015 at 5:55 pm. 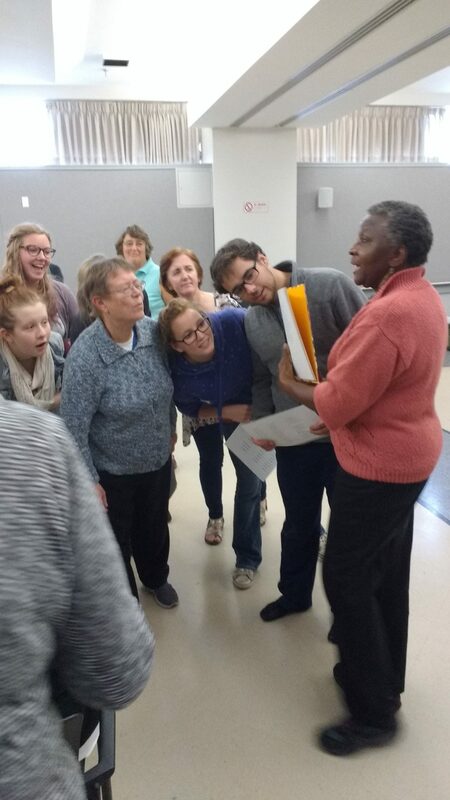 Editor’s Note: The GeriActors and Friends are back in rehearsals for their 2015/2016 season. Here is a blog by Bill Yong highlighting the next few months. September is always a fun time with the GeriActors. The seniors and friends return after a three month break full of energy, new ideas and new stories. This year we are fortunate to have new GeriActors and students from David Barnet’s Intergenerational Theatre Class Drama 427/507 join the group. These new energies and bodies fill the room with inspiration, vitality and conversations that will carry us into the new year. The end of September also marks the beginning of the GeriActor’s cross-province tour. 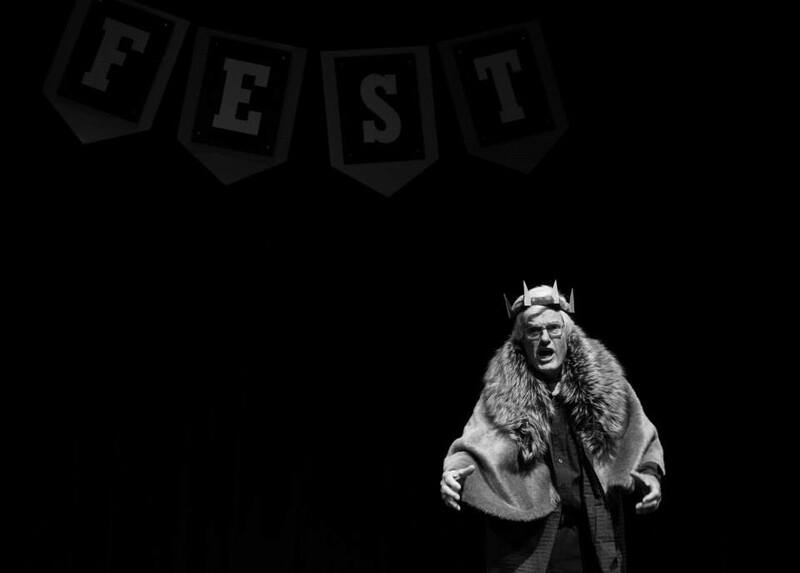 Starting with the Grey Matters Conference in Drumheller, the GeriActors will perform We Decide: an adaptation of Shakespeare’s King Lear and stories by GeriActors and Friends about agency and choosing their path in life. The Grey Matters Conference is a two-day (September 29 – 30) event that offers provincial service providers opportunities to network, gain knowledge and increase awareness of issues, supports and services for seniors. The Town of Drumheller in partnership with Alberta Seniors is co-hosting this conference. Which provides seniors’ service providers with the opportunity to hear from dynamic speakers and learn about best practices, emerging issues and trends that enhance seniors health and wellness. It is taking place in Drumheller Badlands Community Facility, 80 Veterans Way. Be sure to tell your friends in Drumheller to come if they are in town.